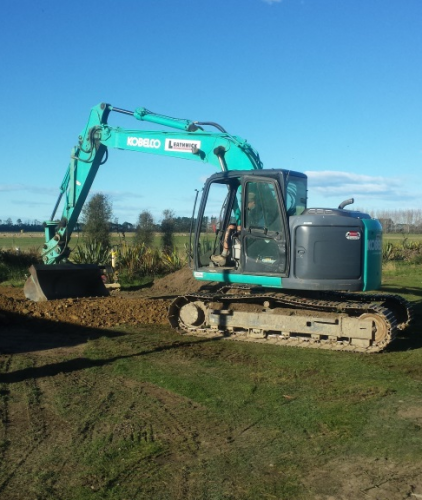 Work on new marae buildings at Arowhenua is well underway. Several Papatipu Rūnanga are currently completing development projects at their marae. Among those working on everything from minor renovations to full building projects are Waihao, Arowhenua, Hokonui, Rāpaki and Koukourārata. For Waihao Marae, building developments will allow marae staff more space to work and host their guests. Rūnanga Chair Graeme Lane says developments have come about due to the increase of manuhiri to the marae. He says additional spaces have allowed staff working on site to have a separate office area away from the hustle and bustle. The marae initially utilised the Ngāi Tahu Marae Development Fund to support the refurbishment of the wharekai, but for these recent additions they have allocated their own pūtea to financially support recent projects. Three portacoms were purchased with the idea to convert two of them into an office and meeting room, with the third for mattress storage. The rūnanga gained council building consent for these portacom offices in May, with builders onsite from June. The new portacom additions are now almost complete and Graeme hopes for a grand opening prior to the rūnanga annual general meeting on 25 September. The mattress storage room, waka shed and existing wharekai are to near completion around Christmas 2016. Graeme explained the process currently underway to create an arched entryway. There are also additional development plans in the pipeline for Waihao including a garden project and the possible extension of the wharenui. Preparations taking place for the Waihao portacom project. Arowhenua Rūnanga are also in the middle of an exciting marae development which includes the demolition and replacement of the wharekai/kitchen. By redesigning these elements they will create an entirely new block and relocate the existing outdoor cookhouse. 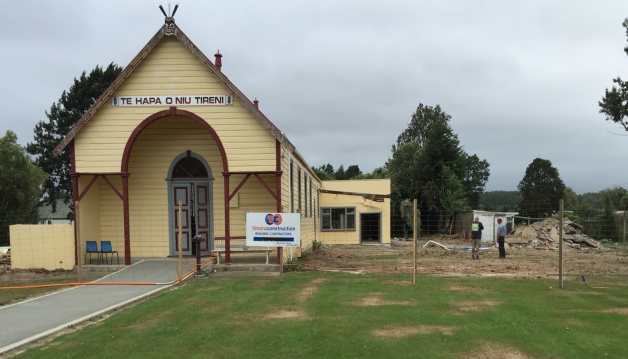 Buildings are focused around the marae meeting house, Te Hapa o Niu Tireni, and some date back to the early 1900s, so discussions have been taking place to determine how these could be refurbished, keeping the old with the new. Arowhenua Rūnanga emphasises that it was keen to create a renovation that not only looked good but also served whānau well from a functional point of view. Hokonui Rūnanga is another committed to new building projects following a devastating 2014 fire that caused extensive damage. At the start of this year they were in the final stages of their rebuild and expansion. These considerable changes will allow better service to whānau and the community. Further up the motu, Te Hapū o Ngāti Wheke held a final poroporoaki for the demolition of their wharekai In May this year with whānau in attendance. Building activity on the site has been very active over the last few months and the rūnaga has consistently updated the wider whānau with progress through Te Pānui Rūnaka. The development of a new wharekai follows the earlier completion of the new marae complex and Whare Tipuna in 2010. On Banks Peninsula, Koukourārata is currently building their whare wānanga with the support of the Marae Development Fund. Built next to the existing marae complex, the whare wananga will serve as an outreach classroom for aquaculture certificates based on its mussel farm. The idea of the whare wananga is considered a crucial one for both whānau and the community as the new building will include an office, teaching space, mattress room and a walk-in chiller. A common theme throughout the papatipu rūnanga completing these projects is the overall benefits that they will provide to whānau, hapū and iwi, as well as the wider community in which these marae are based. Since the Ngāi Tahu Marae Development Fund was established in 2012, 14 of our 18 papatipu rūnanga have accessed the fund for a range of projects. Nine papatipu rūnanga have accessed the fund for a new build, three for a rebuild, and six for urgent repairs. Total allocation since the fund’s inception sits at $7,600,567.